Stretch your budget dollars by purchasing a set of our transportable bleachers. You can then share them between sports fields till you can afford a permanent solution. Our Transportable bleachers are designed specifically to withstand the rigors of movement. Each Transportable bleacher is fitted with a galvanized steel horizontal lifting brace and has extra bracing to stabilize the bleacher during movement. These systems are not intended for use on any public roadways. 5 mph is recommended speed limit. 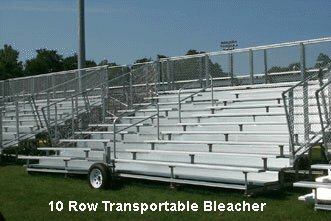 All Transportable bleachers include ground sills and are available in "Standard", "Preferred" & "Deluxe" models, please refer to "Bleacher Buying Need-to-Knows" section below for model features.